The best part about having a potluck at work is that I always know that one of my coworkers will bring a fruit salad or a fruit tray with fruit dip. It is so hard to eat healthy at those get lunch time get together events. The room is filled with crockpots full of delicious recipes that most of the time includes lots of carbohydrates. Delicious honey vanilla fruit dip – much lighter than most dips! I always try to pick out a couple that look and smell irresistible and have small portions of each. But I also try to fill the majority of my plate from the vegetable and fruit trays. And of course, who can resist the fruit dip? 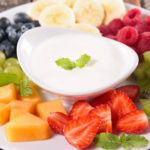 I eat fruit every day, but it is only on those special occasions that I get the pleasure of dipping pieces of cut up fruit in a sweet and flavorful dip. 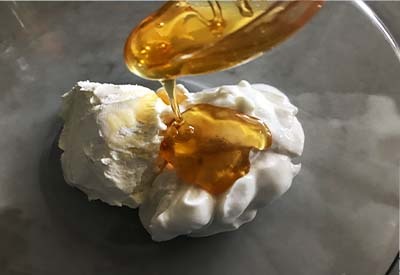 Local honey provides the sweetness in this fruit dip. However, I had no idea what the dip was made of until one day I had a ton of fruit and I decided to make my own fruit tray for a bridal shower. I looked up recipes and the best fruit dips were always made with marshmallow fluff. The same stuff that you used to put on top of your ice cream and drizzle with hot fudge! Surely there had to be a way to make it a little more healthy than that! So I pulled out some greek yogurt that I had in the fridge and added a little reduced fat cream cheese. For the sweetness I added some local honey and for the flavor, a little vanilla extract. A hand mixer works best for this recipe. Everyone raved about it at the party and that is when I decided that the honey vanilla fruit dip was a keeper! I used fat-free vanilla greek yogurt, but you could try different flavors as well. Since this is a smaller yield recipe, I prefer to use my KitchenAid hand mixer and not my stand mixer. However, if you double or triple the recipe a stand mixer would work just fine. 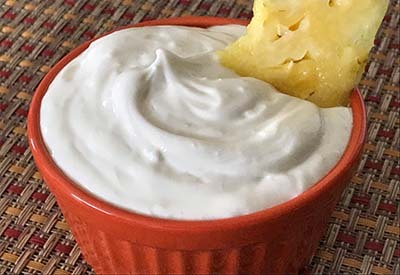 A light and delicious flavored fruit dip - made with just 4 simple ingredients! 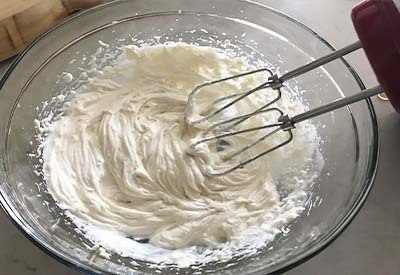 With an electric mixer, mix for several minutes until smooth. Pour dip in a bowl and refrigerate. Serve with cut up fruit.